Welcome to week 25! This week I’ll be looking at elements and figures beginning with Y and Z. This post will include: Yam, Yao, Yarikh, Yei, Yew, Yinlungen Bud, Ymir, Yurlunggur, Yurupary, Zhang Guo, and Zhu Rong. Next week a whole new series of Folklore and Myth Thursday posts will start! Yam is the Canaanite sea god. Like “his Babylonian counterpart Tiamat” (Tresidder, 2004:526), Yam embodies the forces of chaos and disorder and is envisioned as a monstrous creature (see Tresidder, 2004:526). According to the mythology, “Yam challenged the storm god Baal for sovereignty on earth… Baal killed Yam, scattering his remains and thereby that he controls the divine waters that [fall] as fertilizing rain” (Tresidder, 2004:526). Yao is a “mythical early ruler of China renowned for his humility and modest way of life” (Tresidder, 2004:527). Tresidder (2004:527) notes: “[during] his reign, Yi the Archer came to earth to tackle the ten suns that appeared in the sky”. Yao, Yu, and Shun are revered as the Sage Rulers of Antiquity (see Tresidder, 2004:527). Yarikh is the Canaanite god of the moon. “One myth recounts the arrangements for Yarikh’s marriage to Nikkal, the moon goddess, and the subsequent birth of his son” (Tresidder, 2004: 527). “A group of Navajo creator deities” (Tresidder, 2004:527), the Yei are “invoked during ceremonies by masked impersonators” (Tresidder, 2004:527). Tresidder (2004:527) notes the “chief of the Yei is known as Talking God”. The Yew is seen as a tree of immortality (Tresidder, 2004:528), is often “seen in English graveyards, and is associated with strength, resilience, and magical powers” (Tresidder, 2004:528). Tresidder (2004:528) notes that in “superstition, yew was lucky to touch, but unlucky to bring inside the house”. Yinlungen Bud, according “to the Chewong people of Malaya” (Tresidder, 2004:529) is a tree-spirit who “taught humans to share food after hunting and how to bear and raise children”. In the Norse mythology, Ymir is “an androgynous cosmic giant … who arose from Ginnungagap … at the beginning of creation” (Tresidder, 2004:529). Ymir “spawned … three creator gods called the Sons of Bor. The three gods slew Ymir and formed the earth from his body, the ocean from his blood and the sky from his skull” (Tresidder, 2004:529). Yurlunggur is a great serpent and is “believed to be manifested in the rainbow” (Tresidder, 2004:529) and is part of the origin myth of the “Yolngu Aboriginal people of Arnhem Land” (Tresidder, 2004:529). Yurupary, the “Manioc Stick Anaconda” (Tresidder, 2004:529) is a “culture hero of the Barasana people of Colombia” (Tresidder, 2004:529). According to the myth “Yurupary stole fire for humans from the underworld” (Tresidder, 2004:529). Tresidder (2004:529) also notes: “[Yurupary] used [the fire] to kill his brother Macaw, but Yurupary also burned to death and his bones became the charred logs of the first manioc garden”. Zhang Guo is the sixth of the eight immortals of Daoist myth (see Tresidder, 2004:532). “He was said to have lived at the time of the empress Wu (ruled 690 CE – 705 CE) and was famed for his magical skills” (Tresidder, 2004:532). “Zhang Guo bestowed babies on couples and his portrait would often be hung in the marital bedroom” (Tresidder, 2004:532). 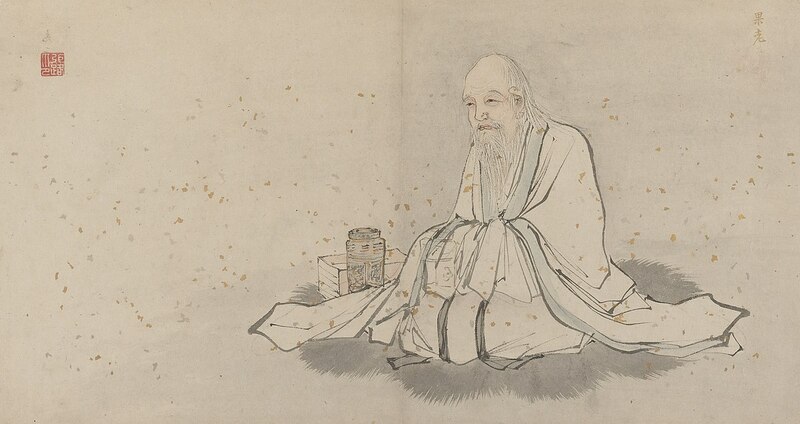 By Zhang Lu (1464–1538) – Telling Images of China (exhibit). Dublin: Chester Beatty Library. Zhu Rong is, according to early Chinese myth, the “benevolent ruler of the universe and god of fire” (Tresidder, 2004:532). “He is said to have defeated the malevolent water god Gong Gong in a battle for control of the cosmos” (Tresidder, 2004:532). Check out The Folklore Podcast – Old Hag Syndrome! Fairies! Slenderman! Fantasy Fiction! Awesomeness! And more!